RuneQuest is another of the "older" roleplaying games that my players and I remain fond of despite its' alleged death. First produced by one Greg Stafford, and closely bound to his own game world Glorantha, it revolutionized gaming at the time because it had a great deal more realism to the way the rules worked. Parries, progression in weapon skills based on how much they were used rather than how many orcs you'd bashed, magic for anyone, and a believable number of hitpoints were all major attractions. The magic systems were a great deal different too, with the first really workable power point system any of us had ever seen. Advancement was through "ticks" awarded to each skill for using it successfully, meaning that if you started with a farmer and he stole a lot of stuff, he became a Master Thief because that's what he was good at, and wasn't necessarily any better in combat, rather than being a Master Thief because he'd acquired lots of money or killed plenty of people. Glorantha, while a wonderful gameworld, wasn't to everyone's tastes, though, and I never actually ran any RuneQuest until the Third Edition. Games Workshop had gotten hold of the rights to produce a hard-backed edition in three snappy volumes (this was back when they were a games company rather than a money-making juggernaught). These books were really nicely presented, although there were never and still aren't enough monsters provided compared to the ludicrous variety available for D&D. They also detached RuneQuest from Glorantha quite nicely, slanting rather towards a generic pseudomediaeval environment (a sort of neutral for DMs to write their own world) or the Alternate Earth packs which appeared at the same time from the original publishers, Avalon Hill. These were really splendid, and included a Vikings pack, lovingly detailed and researched. At the time I and most of my players were also re-enactors with a Viking battle group, so the idea of Vike roleplaying appealed a great deal. Having devoured the supplement, I walked the guys through rolling some characters and the Left Leg Warriors campaign was born. Originating in Viking Scandinavia, then transferring to England (major damage to Liverpool for some reason) and then crossing over to Stormbringer, the campaign spawned some memorable characters and events. Magical items from Ancient Lost Civilizations were simply Roman. Stormbringer evolved seperately out of RQ1 and is specifically set in the worlds of Michael Moorcock. The players met Elric, fought Pan Tangians, settled an island and defeated the Mara vampire who owned it. There was to have been a second Left Leg campaign but it never took off for a variety of reasons. 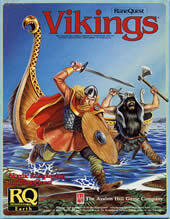 RuneQuest was then given a break for a considerable time in favour of Traveller, and Stormbringer, but eventually the desire to run it again bubbled up and I looked around for something to run; we'd "done" Vikings and were all ex-re-enactors by this point. I'd had a very nice worldpack called HârnWorld for some years, and really fancied using it; it was a really believeable (something I needed after the high-camp craziness of Stormbringer (dragons with drawers!) and gloriously detailed game world. RQ seemed made for it, and so the HârnQuest campaign started off, with peasants, warriors and Drof the Gobbo. This ran for two very successful campaigns and may even surface again. After that I tried a RQ/Stormbringer crossover once more, this time completely removing the RQ magic system and replacing it with the Stormbringer demon summoning and binding, and this was much more workable.The Halfblood pages are here. Some years later, I created a homebrew world called Mereval and ran a fairly successful RQ campaign in that. My RQ software, aging as it is, is available from here.